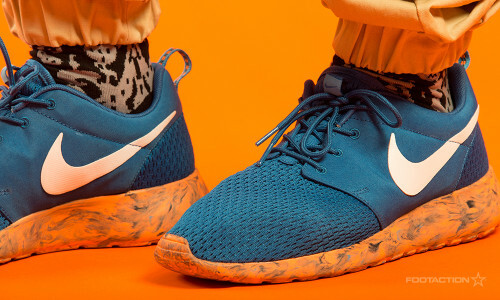 The Nike Roshe Run Marble receives brand new variants in colorways: one dominantly blue sitting atop an orange marbleized sole and the other an “olive” concoction. The materials used in this version of the Nike Roshe Run are mesh and canvas over a traditional Phylon sole. The all-white Swoosh pops on both colorways to complete the build. Check out the pictures in the slideshow to see some accurate use cases for how to #OWNIT. Print article This entry was posted by hhcblog on April 23, 2014 at 3:23 pm, and is filed under Footwear. Follow any responses to this post through RSS 2.0. You can leave a response or trackback from your own site.